Tribulations we face He has already overcome. Can you think of a better reminder that God is Good? The good news is I am different now. The woman who faced the October Nor'easter of 2011 was not here to face Hurricane Sandy. She's been supplanted by the new, stronger, tougher, fiercer me. The here might feel the same, but the me is definitely different. "My faith kept me alive…" Of course it always had, does, but I didn't recognize this place because I'd never been here before. So, welcome to the new, stronger, tougher, fiercer me. She's a warrior, but of the peaceful praying variety. I don't think there's much that can scare me now, because I have seen that God is so much bigger than anything I face. Really. I saw it. I've been here before. How I could approach the same experience so differently is explained in conversation my family and I had in the darkness last night after losing power. Remember the short story The Lady or The Tiger by Frank Stockton? The first time I read the story, I had no doubt about the certainty of my answer. More than 35 years later, I am equally assured that the answer I provided then was incorrect and I am right now. I have been here before, but I am not the same. The world gives us tribulation, but it is not our problem. He has overcome it, and claimed us for His own. I've been here before, but the me is changed. Changed, CHANGED. 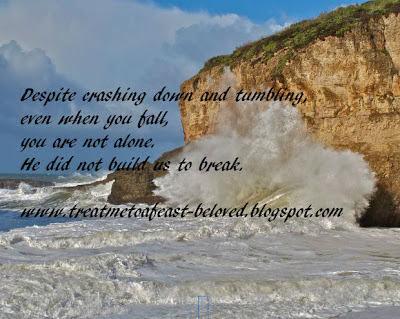 Despite crashing down and tumbling, even when we fall, over, over, and over, coming to places we have been before, WE ARE NOT ALONE, and the tribulations we face He has overcome for us. Can you think of a better reminder that God is Good?